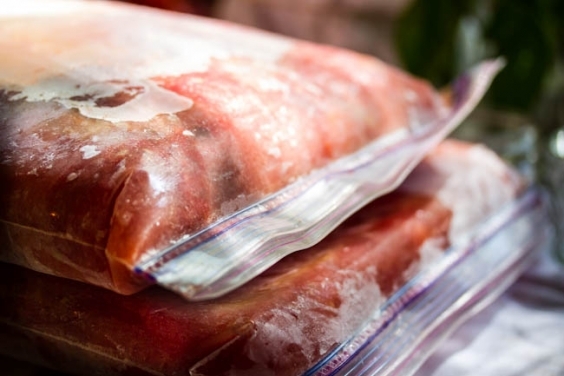 Freezing tomatoes is the easiest way to preserve them. It’s fast. However, be aware that frozen tomatoes lose their texture when thawed and become mushy. They’re suitable for cooked recipes. Also, freezing tomatoes reduces their flavor. Enzymes responsible for a tomato’s taste are rendered inactive below 50ºF. To preserve the most flavor, try canning tomatoes rather than freezing them. On the other hand, putting tomatoes in the freezer is convenient. If you have a small amount of tomatoes (rather than a bushel), you can freeze a couple of containers without heating up the entire kitchen. Use thawed tomatoes in sauces, soups, casseroles, and stews. Keep your freezer below 0º F. Check the temperature regularly with a freezer/refrigerator thermometer. Frozen tomatoes are best when used within 4-6 months, depending on quality of fruit at time of processing and how they are processed for the freezer, but have a freezer life of 8-12 months. Wash tomatoes individually under running water. Avoid filling a sink or bowl with water and washing tomatoes all at once, because germs accumulated in the water can be absorbed through stem scars. Use plain water. Detergents and soaps can also be absorbed into tomatoes through the stems. Cut away stem scar (“core" the tomato). Will you freeze tomatoes whole or chop them in some way? Will you peel tomatoes or leave them unpeeled? Will you cook tomatoes before freezing or freeze them raw? Freezing tomatoes whole is the fastest method of preparation. Of course, when you slice, chop, or puree tomatoes, you can fit more of them into freezer containers. What's the difference between all these methods? Peeled. Removing tomato skins takes a little bit more time, but the added step provides consistent texture. Unpeeled. By leaving skins on tomatoes you get extra nutrients and fiber. But bits of skins left on tomatoes can be tough and chewy, even after processing and freezing. Dip tomatoes into boiling water for 30-60 seconds. Use a slotted spoon to retrieve them. Plunge tomatoes into ice water. Skins will slip off easily. Raw. Putting tomatoes in the freezer raw saves a step – and therefore some time. But keep in mind that thawed raw tomatoes will have an especially mushy texture. 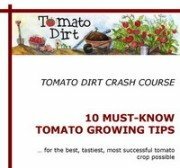 Avoid substituting them in recipes that call for fresh tomatoes. Cooked. Most agree: tomatoes taste better if they’ve been cooked before freezing. Also, cooked tomatoes last longer in the freezer than those frozen raw. Plastic freezer containers, plastic freezer bags, and vacuum-sealed bags are the most common choices. There are advantages and disadvantages of different containers for freezing tomatoes. Use thawed tomatoes in cooked recipes. After freezing, don’t try to substitute thawed tomatoes for fresh tomatoes. Freezing makes texture mushy. Frozen tomatoes, when thawed, are best in soups, sauces, stews, and casserole recipes. Let tomatoes packed in plastic bags to defrost in a bowl. Defrosted tomatoes will separate into juice and pulp. Use both in your recipes to get full amount of nutrients. Get more tips about Freezing Tomatoes Pinterest board.